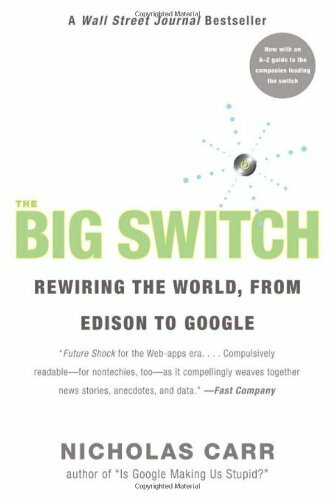 In this edition of the book club, I thought that I would focus on a book called “The Big Switch”. This is an interesting book because it talks about how all technology moves through the same phases where they are introduced, someone makes a lot of money off them because they own the market space, and then the technology becomes more of a commodity that is commonplace. The examples that he uses in the book range from water wheels, to electricity, and then to software, and that companies like Google are the leading wave because they are commoditizing technologies for the masses through services. Why is this important to us? Because it implies that the business software is heading much the same way. And every now and then we see this mentality in the market place when customers and prospects have the impression that all ERP systems are comparable. This means that they are then making decisions based on price rather than on functionality, service, fit and quality. If you get a chance, take a look at this book – and also Nicolas Carr’s other book – “Does IT Matter”. It’s interesting – even though I don’t agree with where he ends up.